Previously, we discussed about ESP8266. Working With ESP8266 Not Exactly Just Easy. Here is Circuit Diagram, Code to Setup Arduino WiFi Control of LED From Web Browser to Help New Users. We searched the whole web as much possible to find easiest tutorial which a newbie can follow. Basically, ESP8266 as one component involves complex networking matters. There are development boards for IoT, which are easier for anyone to create things. Connecting ESP8266 with Arduino needs lot of research for your particular model, version. This guide is basic IoT setup. ESP8266 is a serial WiFi module capable of sending and receiving data from the Web over the internet. It is probably better if you setup ESP8266 with Arduino following just basic guide on official Arduino’s site than ours this one for first attempt. After copying the below code to Arduino IDE, compile and upload to the UNO. Then run serial monitor. Make sure you have test the NL and CR option and as well as right baud rate on serial monitor on the IDE. This Article Has Been Shared 1244 Times! 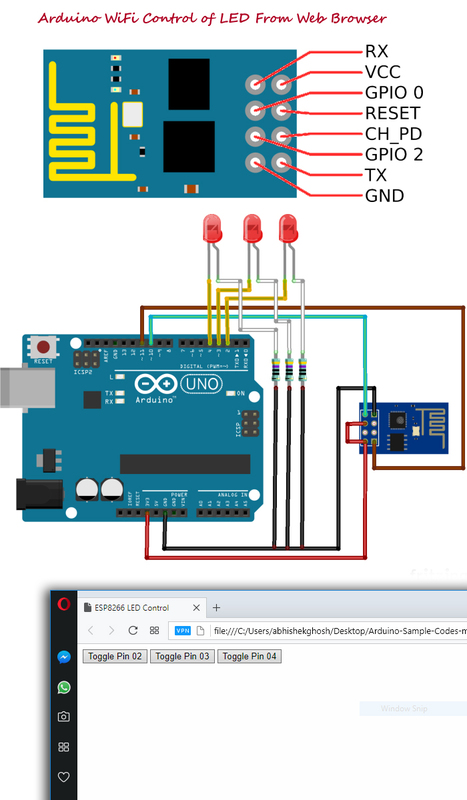 Cite this article as: Abhishek Ghosh, "Arduino WiFi Control of LED From Web Browser," in The Customize Windows, April 19, 2018, April 21, 2019, https://thecustomizewindows.com/2018/04/arduino-wifi-control-of-led-from-web-browser/.